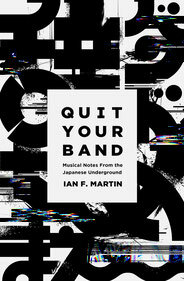 Quit Your Band! Japanese edition "バンドやめようぜ！" now in stores! 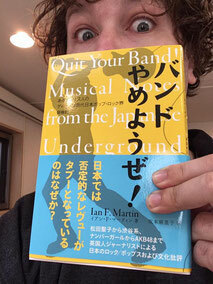 It’s an interesting choice for a title in that it works as a more or less direct translation of the English, albeit phrased more as a call to arms than an instruction, while at the same time it’s a play on “Band Yarouze!”, which is either a Japanese TV show, video game or both. That title alone seems to have done a lot to gather interest in the book in advance of the release, and judging from the chatter online since the release, that interest seems to be spilling over into the book itself. Obviously when writing it I had to be aware of two different audiences it would reach, each with different backgrounds of knowledge and different conceptions of my role as a commentator. To English-speaking audiences, my value as a commentator is as an insider, while to Japanese audiences, what they want from me is an outsider’s perspective. Of course I’m both, and that was something I had to take into account during the writing process. An interesting reversal is in play in the way the translator, music journalist Mariko Sakamoto, is a Japanese expat living in the UK who made her name covering the explosion of new bands coming out of London and New York in the early 2000s, while I’m a British immigrant living in Tokyo whose reputation, such as it is, rests on my coverage of Japanese music over the same period. Our experiences of the UK and Japan are almost exact inversions of each other, so while living in the UK probably gives her some insight into my background, being absent from Japan over the main period the book covers means she has some sense of the audience’s position as well (the musical environment I’m describing is pretty obscure for the most part, even to people living in Japan). 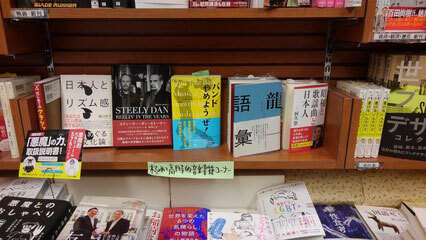 The other interesting thing about the Japanese edition and its audience is the way the publisher, big indie label P-Vine’s Ele-king Books imprint, clearly envisions a wider audience for the book than would have been possible for the English edition (they’re looking for thousands rather than hundreds of sales). This means there are going to be people far outside the music audience I know and recognise from my weekly gig-going who encounter the book, and they’re going to bring with them all sorts of expectations I hadn’t accounted for. This has been a source of certain anxiety for me over the past few weeks, but it’s out in the world now, so I guess I’ll just have to wait and see.